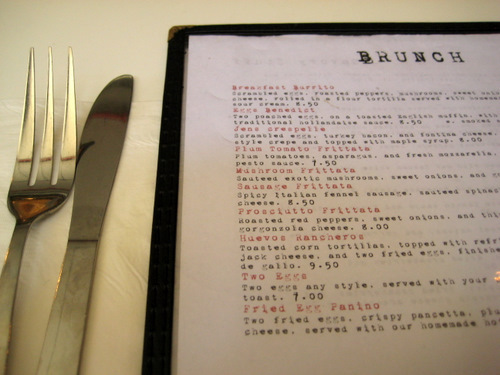 E and I usually meet up for dinners, but since she changed jobs, we can actually partake of brunch now. Sp we had our first ever brunch together at Cafe Lift. Cafe Lift is… where nothing else is. Well, it’s down the street from Prohibition Taproom, but that’s really all there is. It’s definitely a destination. It’s in the lower level of what seems to be a loft building. It’s decently roomy. It does get extremely loud here. 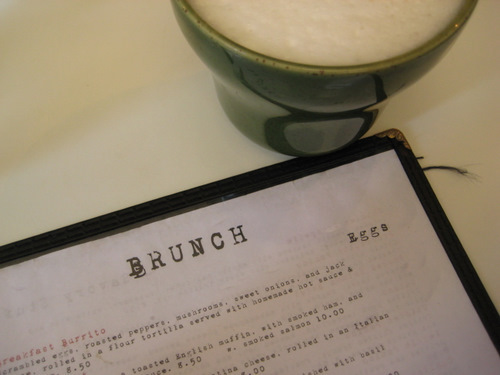 It’s all about brunch here. They’re only open from 9-3. E got some hot chocolate to start. Ok, the food here is ridiculous, like seriously ridiculous. Ridiculously good, and ridiculously luxurious. If you are, say, watching your weight, or care about health, then just keep on moving. It’s all about excess here. So just soak it in and enjoy it. 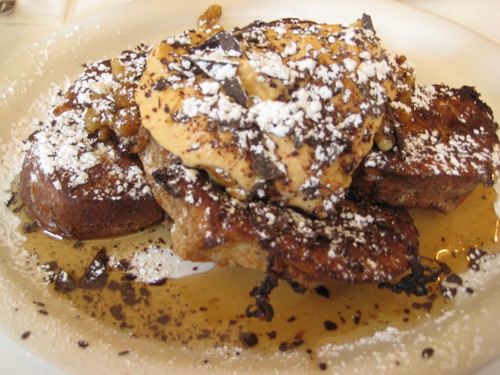 Tis the season for pumpkin canolli french toast. Made with challah bread, it is topped with homemade pumpkin canolli filling, maple soaked walnuts, powdered sugar, chocolate, and homemade whipped cream. This is super rich and sweet and not for the faint of heart. If you like french toast and pumpkin, then this is the dish for you! They also do some great frittatas. 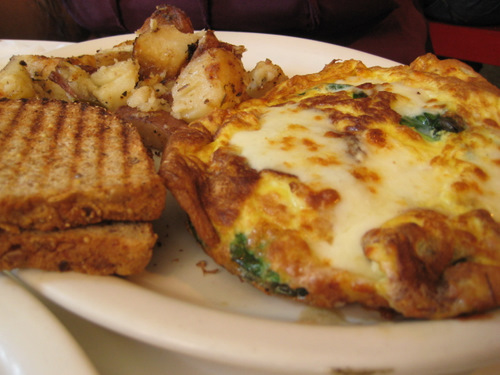 This is the sausage frittata with spicy italian fennel sausage, sauteed spinach, and fresh mozzarella cheese. Man, so freakin good. Really, everything about this is good. I got the huevos rancheros because I saw it at the next table and it looked too good to pass up. 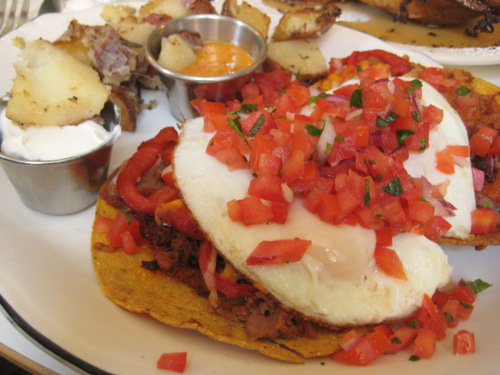 Toasted corn tortillas are topped with refried beans, roasted peppers, jack cheese, two fried eggs, grilled chorizo, and topped with fresh pico de gallo. Delicious, just plain delicious. And it’s served with these awesome potatoes and sour cream and a spicy aioli. It’s all damn good. It’s also tons of food and quite affordable. Yes, it’s a little bit in the middle of nowhere, but definitely worth the exploring. Rancheros look diesel. This place sounds right up my alley now that i’ve given in to excess. That pumpkin French toast was ginormous!!! I was so busy shoveling it in that I didn’t even realize!